This time four years ago, Dean Harrison was practically unheard of but in 2015 he will start the road racing season as a fully fledged factory backed rider preparing for a real assault on the big prizes. The 26-year old took his maiden International victory at last year’s Isle of Man TT races, winning the Lightweight race, but in the winter months has switched from the RC Express Racing team to ride for Mar-Train Racing on a full-time basis having ridden for them in the Supersport class in 2014. It’s a move that sees him become part of the official Yamaha team on the roads and after a successful first test session at Alcarras, Spain, which was his first outing on a bike since breaking his arm at last August’s Ulster Grand Prix, he’s now ready to go racing. “It was good to get back on a bike after six months off,” admitted Harrison. “Initially, the bike felt like a missile with not riding for so long but my first impressions of the R1 were very favourable and it felt really good, particularly in the mid range. We were only out on the Stocker but just kept trying different things and had no major issues at all. Having worked with Tim Martin’s Mar-Train Racing team last year, Harrison knows exactly what to expect and although he now has the tag of a ‘factory’ rider, it’s not one he’s unduly concerned with and is instead just looking forward to all the meetings that lie ahead. “There’s no extra pressure on me at all and I’m just approaching this season as I have done all the rest,” added the Yorkshire man. “I’m learning all the time and am constantly chipping away, which is the best way to do things. I’ve improved year on year and to make another stride forward is what I want to do again in 2015. My results and speeds have got better year on year and by having the same approach, I’m hopeful they’ll get better still. On the roads, it’s the best way to do things as the harder you try, the slower you go. It’s a venue the Bradford rider has excelled at in the past and the first road race of the season should see him again enjoy close battles with, amongst others, Guy Martin and Ivan Lintin, the man who’s replaced him at RC Express Racing. 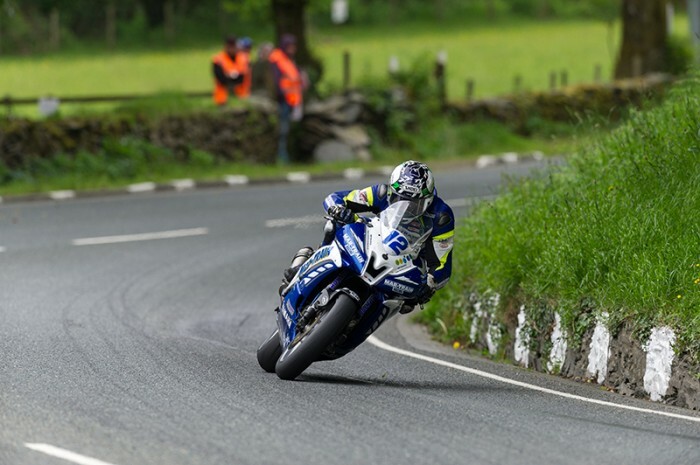 Joining Yamaha means Harrison won’t be defending his Lightweight crown at the TT and, having finished first and second in the race for the last two years, he’s disappointed but philosophical about missing out.